A redstone comparator is a block used in redstone circuits to maintain, compare, or subtract signal strength, or to measure certain block states (primarily the fullness of containers). To remove a redstone comparator, mine it. A redstone comparator can be broken instantly with anything, and drops itself as an item. if its attachment block is moved, removed, or destroyed. if water flows into its space. if a piston tries to push it or moves a block into its space. If lava flows into a redstone comparator's space, the redstone comparator will be destroyed without dropping itself as an item. A redstone comparator can be placed on the top of any opaque block with a solid full-height top surface (including upside-down slabs and upside-down stairs), as well as on hoppers. In Bedrock Edition, a comparator can also be placed on top of glass, stone walls, fences and cauldrons. To place a redstone comparator, use the Place Block control. The redstone comparator can take a signal strength input from its rear as well as from both sides. Side inputs are only accepted from redstone blocks, redstone dust, redstone repeaters, and other comparators. The redstone comparator's front is its output. It takes 1 redstone tick (2 game ticks, or 0.1 seconds barring lag) for signals to move through a redstone comparator, either from the rear or from the sides. This applies to changing signal strengths as well as simply to turning on and off. Redstone comparators usually will not respond to 1-tick fluctuations of power or signal strength — for example, a 1-clock input will be treated as always off from the side, and always on from the rear. The redstone comparator has four functions: maintain signal strength, compare signal strength, subtract signal strength, and measure certain block states (primarily the fullness of containers). 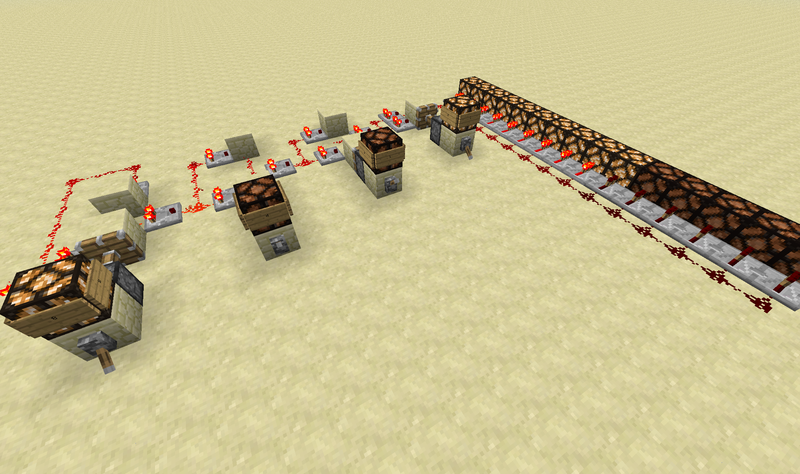 A redstone comparator with no powered side inputs will output the same signal strength as its rear input. A redstone comparator in comparison mode (front torch down and unpowered) will compare its rear input to its two side inputs. If either side input is greater than the rear input, the comparator output turns off. If neither side input is greater than the rear input, the comparator outputs the same signal strength as its rear input. A redstone comparator in subtraction mode (front torch up and powered) will subtract the signal strength of the highest side input from the signal strength of the rear input (minimum 0 signal strength). For example, if the rear input signal strength is 7, the left side is 2, and the right side is 4, then the output will be a signal strength of 3, because 7 - MAX(2,4) = 3. A redstone comparator can measure the fullness of a chest, as well as other block states, even through a block. A redstone comparator will treat certain blocks behind it as power sources and output a signal strength proportional to the block's state. The comparator may be separated from the measured block by a solid block. However, in Java Edition, if the solid block is powered to signal strength 15 the comparator will output 15 no matter the fullness of the container. 1 1i 1i 1i 1i 1i "13"
A redstone comparator used to measure the state of a container outputs a signal strength in proportion to how full the container is (0 for empty, 15 for full, etc.). Generally speaking, the comparator output signal strength represents the average fullness of the slots, based on how many of that item form a full stack (64, 16, or 1 for non-stackable items). The Minimum Items for Container Signal Strength table (right) shows the minimum number of 64-stackable items required to produce the different signal strengths from each type of container. Numbers followed by an "s" or "i" indicate the number of full 64-stack equivalents ("s"), and additional items less than a stack ("i") required. For items which stack in 16s (snowballs, signs, ender pearls, etc. ), divide the "i" number by 4 and round up. Each non-stackable item counts as one full stack. For example, to produce a signal strength of 10 from a hopper requires the equivalent of 3 full stacks plus 14 more items, which is 206 items total, assuming they all stack in 64s. When a comparator measures a large chest or large trapped chest, it measures the entire large chest (54 slots), not just the half directly behind the comparator. A chest or trapped chest which cannot be opened (either because it has an opaque block or ocelot above it) will always produce an output of 0 no matter how many items are in the container -- shulker boxes can always be measured, even if they cannot open. When a container is empty, the output is off. Note that a non-stackable item is counted as a full slot (1 item in a slot, with a max stack size of 1: 1 / 1 = 1.0), and items which stack up to 16 (such as ender pearls and snowballs and eggs) are similarly considered a full slot at 16. Comparators used to measure containers. A cake outputs a signal strength relative to the amount of cake remaining. Each slice is worth 2 signal strength, with 7 total slices, for an output of 14 for a full cake. A cauldron outputs different signal strengths depending on how much water is inside. From completely empty to completely full, the output values are 0, 1, 2, and 3. A command block stores the "success count" of the last command executed, which represents the number of times the most recently used command of this command block succeeded. A "success" is defined by the command's success conditions: if a red error message is returned in the chat, the command was not successful. Most commands can only succeed once per execution, but certain commands (such as those which accept players as arguments) can succeed multiple times, and the comparator will output the number of times it succeeded (maximum 15). A command block continues to store the success count of the last command executed until it executes its command again, thus the comparator will continue to output the same signal strength even after the command block is no longer being activated (it doesn't turn off when the signal to the command block turns off). An end portal frame outputs a full signal of 15 if it contains an eye of ender and zero otherwise. A comparator can measure the presence and rotation of an item frame's contents. A comparator can measure the state of an item frame's contents. An item frame comparator will output 0 if the item frame is empty, or 1 to 8 for any item depending on its rotation: 1 at initial placement, plus 1 for each 45° of rotation for a maximum of 8. In order for a comparator to measure an item frame's contents, it must be placed behind the block the item frame is attached to, facing away from the item frame. A jukebox outputs a signal strength which indicates which music disc is currently playing. For which music disc produce which signal strengths, see the Minimum Items for Container Signal Strength table above. A redstone comparator is defined by its ID, block data, and block entity. A redstone comparator also has a block state which is expected to replace the functionality of block data in a future version. In Bedrock Edition, redstone comparators use the following data values: A redstone comparator's block data specifies its orientation, mode, and powered status. or the opposite from the direction the player faces while placing the comparator. subtract Specifies the current mode of the redstone comparator. true True if the redstone comparator is being powered. A redstone comparator has a block entity associated with it that holds additional data about the block. Jeb stated that there may be a "capacitor" in Minecraft. Dinnerbone released pictures of the first version of the "comparator", stating it was a replacement for the "capacitor" idea which has variable, alternate inputs. Dinnerbone released one more picture of the comparator. The picture itself showing a digital-to-analog converter, using the comparator as the main block. Added redstone comparator, with 0 delay. Added delay of 1 game tick (1⁄2 redstone tick) to comparator to fix bugs. Added ability to measure containers to redstone comparator. Updated texture to show quartz in the middle. Changed algorithm for measuring containers so that comparators output a signal with as few as 1 item in the container. Comparators now treat large chests as a single container. Comparators now output success count of command blocks. Comparators now measure container minecarts on detector rails. Comparators no longer cause constant block updates, the delay is made consistent, and side input no longer causes a pulse output. Block 150 (powered_comparator) is no longer used; powered state is now represented by the 8s bit on block 149 (unpowered_comparator). Comparator delay changed from 1 game tick (1/2 redstone tick) to 2 game ticks (1 redstone tick). The redstone signal strength from a comparator next to a brewing stand with 3 water bottles in it is the same as one with 3 water bottles and 1 ingredient in it. Comparators now measure cauldrons and end portal frames. The item forms of blocks 149 (unpowered_comparator) and 150 (powered_comparator) were removed from the game. They can no longer exist in inventories, only as blocks in the world. Comparators now measure item frames. Comparators' side inputs now take power from redstone blocks. All 3 IDs for the redstone comparator got merged into one ID: comparator. Comparators now render the underside. Prior to The Flattening, these blocks' numeral IDs were 149 and 150, and the item's 404. Can now measure item frames. Issues relating to "Redstone Comparator" are maintained on the bug tracker. Report issues there. This page was last edited on 18 April 2019, at 07:24.